There's nothing quite like a good decluttering session! It's always a great feeling of accomplishment when you finish, even if it's just a small project. 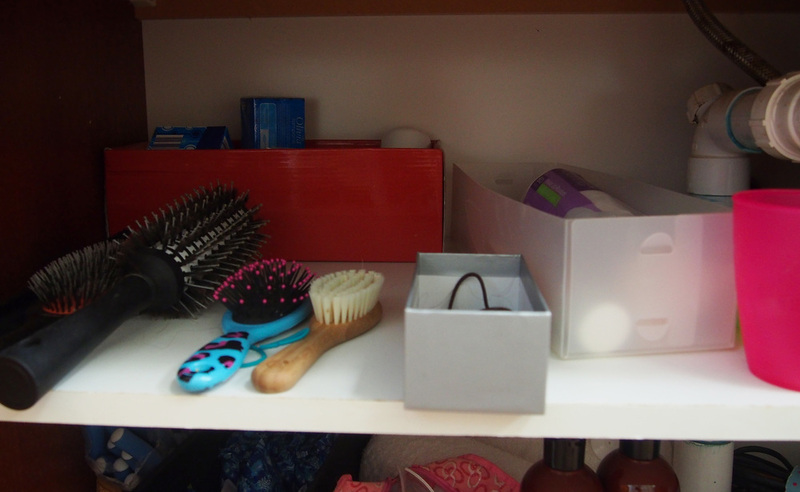 I recently tackled a bathroom declutter and vanity organisation which only took half an hour, and using some cheap and easy storage solutions, led to an organised and easy-to-use space. I think the bathroom is the only room in the house I've never blogged about! The reason being, it's my least favourite room in terms of decor. It's a nice sized room, and has 'potential' so we've always had big plans for doing it up. But it's always been put on the back-burner, and in the 8 years we've lived here, the only thing we've done is touch up the paint. I don't mind the vanity that came with the house - it's quite a big size, and with a new top, sink, and a good paint job it could come up nicely. I have visions of doing this or this to it sometime down the track. This vanity will eventually just be used for the kids when we build our ensuite. So although it might not look great, at least I can get it organised on the inside! Don't you love some good before shots? Here's what we had going on pre-declutter....eek... There were some vague attempts at organising going on with small containers, shoe-boxes and toiletry bags. Not working well obviously. 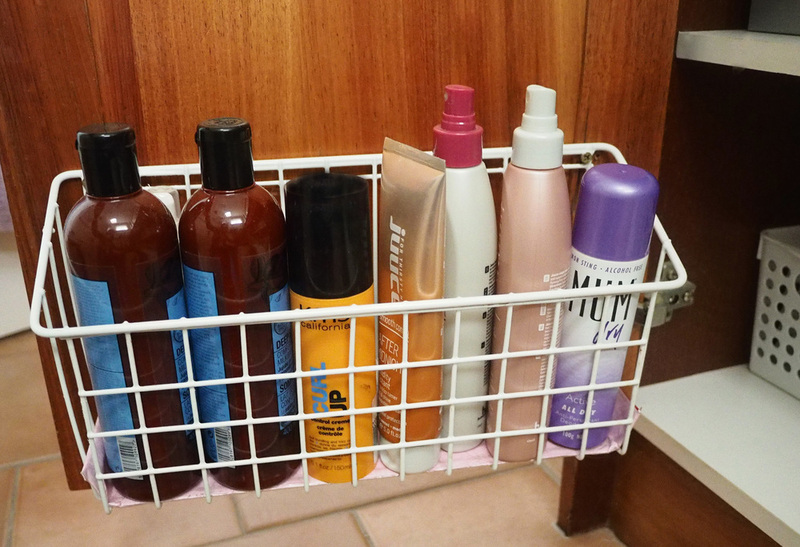 I got the door storage unit below from Aldi, and it is a great solution for having all my hair supplies and taller bottles in an easy-to-reach spot. But it needed a good clear-out and a way to prevent everything from falling over when the door was closed. I already had organisers in my own drawers but this was the state of my husband's (he only gets one drawer out of the whole vanity for his stuff. Ha). Obviously, he needed some drawer organisers too! First step as always - take everything out and get rid of any products no longer used/needed. While the unit was empty, I gave every surface a good wipe-down - bathroom vanities can get pretty grotty! Starting with the drawers, I popped some organisers into Damian's - they are these clear drawer organisers that clip together at the sides. They are intended for wardrobes (you can see here how I used them to organise in our chest of drawers) but they are perfect for any drawer really. I've used them in my own drawers for a few years, and like the smaller ones to separate make-up supplies (not that I have an enormous collection). The door storage unit was next. You can see how I lined the bottom to give the products a flat surface to stand on, as the products were not standing properly on the wire base. This is just a piece of coloured paper covered in clear contact and cut to size. My solution for getting everything to stay standing was just to lay an empty bottle behind these ones so they are propped up. I did a bit of reorganising so that the hair essentials and taller products were right at hand. 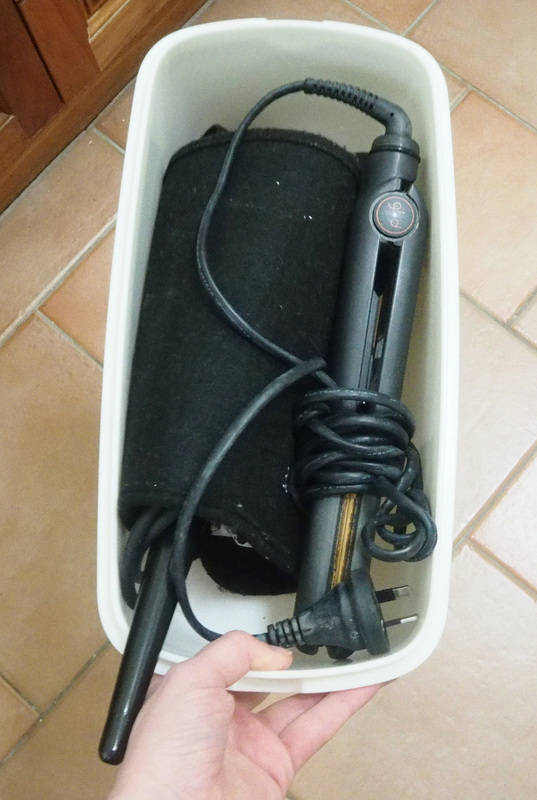 A quick look at the contents - hairbrushes, products not used as often, hair tools, hair accessories, nail polish and tools. 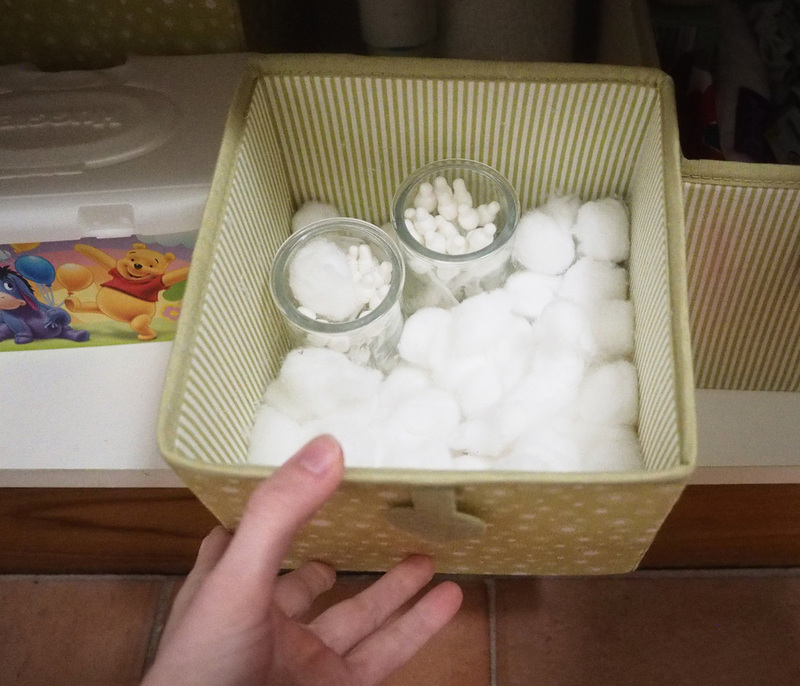 I also used the storage containers that were previously on my daughter's change-table to organise the extra/back-up supplies, cotton wool and ear buds. I managed to restrain myself from labelling for this project. Love a side-by-side comparison for a big pat on the back. Now just have to close my eyes and imagine the vanity painted white with beautiful handles... A girl can dream! 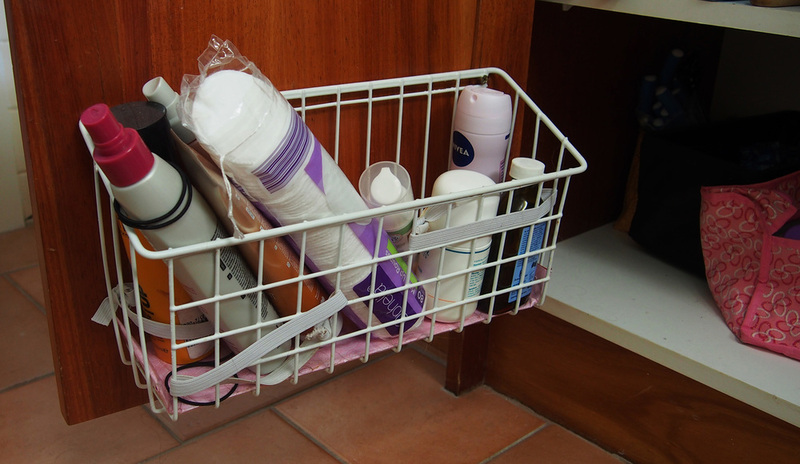 How do you keep your bathroom clutter under control? 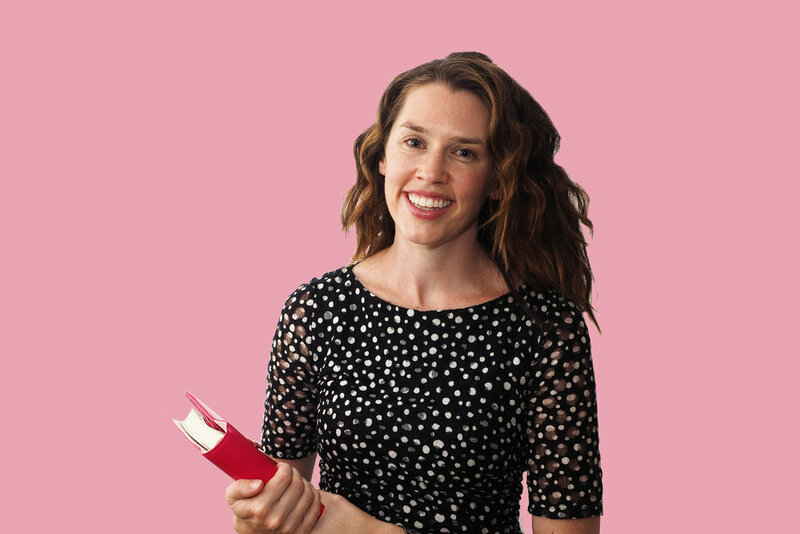 Have you had 'organising success' recently with one project leading to another?